​Susan Woodhouse was born in 1872 in Newton Heath, Manchester, to Edward M Shepherd, a manufacturing chemist, and his wife, Susannah. The 1891 census describes Susan as a 'teacher of music'. She was married in 1897 in Prestwich, Manchester to William Henry Woodhouse, son of Simeon and Fanny Woodhouse. Simeon was a pawnbroker, as was William. William and Susan moved to Lytham St Annes and the 1911 census shows them living at 107 Warton Street, Lytham. They later lived at 20 Cyprus Avenue, Fairhaven, Lytham St Annes. 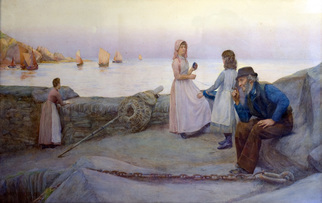 In 1946 Susan donated, Harbour Scene with Figures by Henry Meynell Rheam. (Acc No. 200). William died in 1918, aged 50. Susan died in 1948, aged 77, in Lytham Hospital. In her bequest of 29 November 1948 she left an oil painting, Shore Scene with Beached Boat in Rough Water (Acc No 97), which she had painted herself. On the reverse is inscribed, 'Copied by Mrs S Woodhouse at Art School, St Annes'. Susan left a total of 10 paintings including this one. The others, presumably also by Susan Woodhouse, have been untraceable since 1968, having apparently been 'loaned temporarily to the Children's Cottage Homes at Kirkham of the National Assistance Board' on 7 February 1949.